The Celestron 44314 is a compact yet powerful digital handheld microscope which is a perfect companion for up-close observation on the go. The onboard 3-inch, full color TFT LCD screen flips out and rotates 270 degrees when you need it, and then folds back into the microscope body for portability. It has versatile ergonomic design can be used three ways - handheld, on a flat surface with flip out leg, or with the included metal stand and ¼-20 connection. The 44314 has built-in 5 MP 1/4"color CMOS sensor and 5-element IR cut lens configuration which capture high definition images and video. A ring of 8 adjustable LEDs provides the perfect illumination for your shot. FlipView, with its 10x to 120x magnification is a low-power microscope perfectly designed for viewing an array of 3D specimens, from beach sand to bugs, coins and currency, documents, circuit boards, and more. The Celestron 44314 2-Pack has many exciting features for users of all types. You can extend the lifetime of your Celestron 44314 2-Pack with the purchase of a FactoryOutletStore Factory Protection Plan. 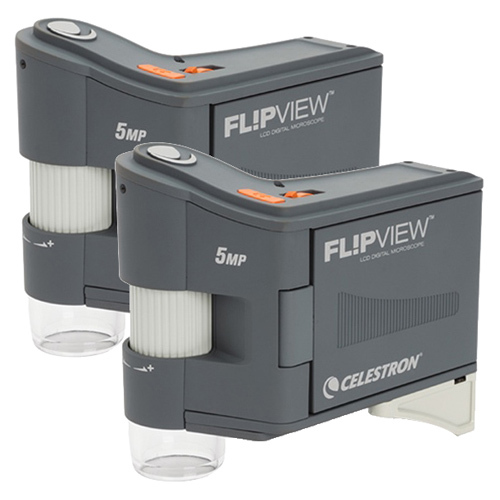 See the Celestron 44314 2-Pack product video and gallery images above for more details. The Celestron 44314 2-Pack is sold as a Brand New Unopened Item.